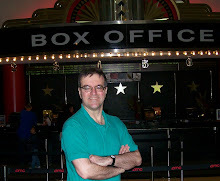 The electricity is palpable from the first note of the overture, as the audience enthusiastically applauds every tune. The deep red curtain promises a rich dessert, and neither the production nor its much-publicized star disappoint. Bette Midler is completely winning from the first moment she lowers her newspaper on the streetcar and her million dollar smile beams forth knowingly. Chaos erupts at that moment, and Dolly’s descent from the streetcar is momentarily halted as Midler acknowledges the cheers. But though the crowd is equally vociferous after each of her numbers, this is not just a star turn, but a real performance. As widowed matchmaker Dolly Gallagher Levi, Midler evokes considerable pathos and, likewise, all her comic business is carefully within character. Though Midler is very much the focal point, this is an altogether splendid revival of the classic 1964 musical, across the board. David Hyde Pierce makes a marvelous Horace Vandergelder, the penny-pinching Yonkers merchant. Unrecognizable under his wig and whiskers, he plays the misanthropic miser perfectly, and makes “It Takes a Woman” his own. He’s also been allowed a reinstated song cut from the original production “Penny in My Pocket” which he performs superbly “in one” at the start of the second act. 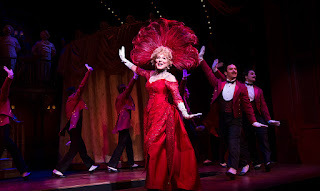 Kate Baldwin is an absolutely lovely Irene Molloy, the widowed milliner whom matchmaker Dolly has initially set up for Vandergelder until, that is, Dolly decides she’ll go after him herself, and her lyrical “Ribbons Down My Back” is a highlight. Gavin Creel makes an exuberant, strong voiced head clerk Cornelius Hackel, and Taylor Trensch is appealing as his youthful sidekick Barnaby. Beanie Feldstein earns laughs a Irene’s giddy assistant Minnie Fay. There’s a brief gem of a performance by Jennifer Simard as Ernestina Simple, the dreadful girl Dolly intentionally lines up for Vandergelder as a turn-off. 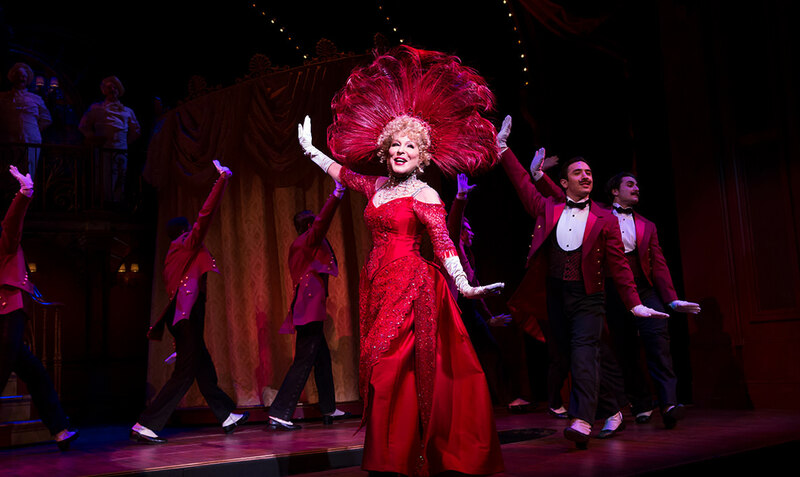 Midler’s grand second act entrance in a red gown at the Harmonia Gardens is, of course, the big moment everyone hopes it will be. Midler plays it to the hilt, with a glimmer of intentional self-consciousness that signals to the audience that she knows “this is it!” and she feigns exhaustion at one point after traversing the runway. She scores all the right points in her eating scene with Vandergelder at the restaurant -- “You go your way, I’ll go mine” (pointing in the same direction), though the protracted, self-absorbed eating scene that follows (a variation on Carol Channing’s original staging) does go on. There are some echoes of the familiar Streisand movie throughout: the painted drop that opens the show resembles the film’s freeze-frame opening, Creel’s awkwardness occasionally echoes Michael Crawford’s, and Midler gets to hum a bit of “It Takes a Woman” as Streisand did. But Midler’s mannerisms are all her own, and she acts quite movingly in all her apostrophes to her late husband Ephraim, including the one that leads up to her big first act closer, “Before the Parade Passes By.” She’s genuinely touching in those moments. Director Jerry Zaks is in his element with his sort of material, and choreographer Warren Carlyle pays respectful homage to original director/choreographer Gower Champion. Santo Loquasto’s brightly colored sets -- lighted by Natasha Katz -- and costumes are dazzling, as they, too, pay homage to the look of the original. The now classic score sounds better than ever in Larry Hochman’s new orchestrations as led by Music Director Andy Einhorn. I remember seeing Channing in this in her pre-Broadway tryout in Detroit and it was mesmerizing. I can see how Bette would bring her own style to it -- and impeccable voice and comic timing. Yes, if I was headed to NY, this would be on the list!